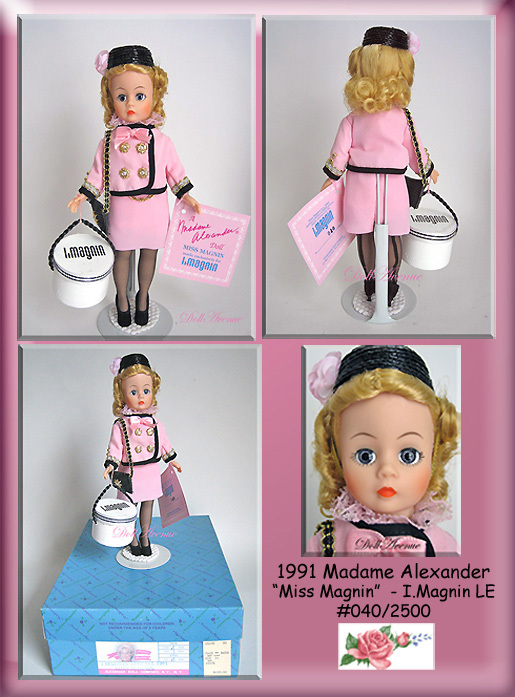 Here is a fabulous and RARE Madame Alexander 10" Cissette "Miss Magnin," made exclusively for I.Magnin in 1991. This LE #40/2500 was only produced for one year. This chic blonde sophisticate has a wonderful complexion with peachy skin tones and bright blue eyes. Miss Magnin is fashionably dressed in a "CHANEL" two-piece pink suit consisting of a knee-length straight skirt and double-breasted jacket with gold signature style buttons, black and gold piping, and a pink bow at the neckline. Under the jacket is a lacy blouse. Complimenting her sharp suit is a black pillbox hat with organdy flower, a black "CHANEL" chain-strap purse. Completing the outfit are black nylons and heels. Miss Magnin carries her I Magnin hat box from her latest shopping spree! The details on this particular doll are just wonderful! This stylish doll will arrive in excellent, preowned condition with her hand tag, registration card, and original box. Stand not included.